Safety is an important part of our lives. How do we determine if a machine is safe to operate or even safe to be around? Sometimes it is possible to simply look at a machine and determine whether it is safe just by watching it. However, when a new operator is to operate a machine most of the time there is some training needed from an experienced operator on how to operate it. With training, the new operators become familiar with how a machine operates. However, a new operator may not have been informed of all the hazards associated with the machine because experienced operators can unintentionally not disclose particular hazards because they have become accustomed to working around them for many years. If these vital pieces of information are not shared, new operators may experience a near miss or injury because information was not passed on. How can we prevent a situation like this from happening? While it is nearly impossible to completely remove the chance of someone being injured by some machines, it is possible to drastically reduce the chance of an injury occurring. This can be done by conducting machine safety risk assessments. Machine safety risk assessments are made up of several steps to determine the hazards associated with a machine and then work to reduce the dangers to an adequate level. It starts by identifying the limits of the machine: what is the machine, who operates it, how much area does it occupy, and other limits are identified. Once the machine parameters are known the hazards such as crushing and entanglement, or task hazards like loading, clearing jams, and cleaning are identified. Next, a severity rating is assigned to each of the hazards or task hazards identified to identify how bad the hazard is before any safety reduction devices are implemented. 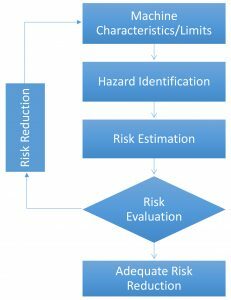 Once a value has been assigned to the hazard it is possible to evaluate the hazard compared to standards and determine if safety reduction is needed. If the hazard has an acceptable amount of risk no reduction is needed. If there is an unacceptable amount of risk, engineered safety devices are used to mitigate any danger. After the engineered safety devices are in place, the hazards are assigned a new severity rating and reevaluated to determine if the safety devices have adequately reduced the hazard to an acceptable level. 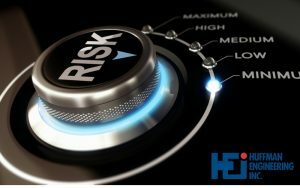 By using the machine safety risk assessment process, Huffman Engineering, Inc. identifies the hazards associated with a machine, takes corrective steps to reduce the hazards and validate the hazards that have been reduced. Huffman Engineering works with their customers to quickly and adequately resolve risks so that both experienced and inexperienced operators can operate the machine without putting themselves in a risky situation. Safety is our priority and performing safety risk assessments confirms our concern for our customers and their well-being.